The Kfz. 385 tank lorry was obtained from the multi purpose Kfz.305 (Opel Blitz) and was used for standard refilling of the German aviation during WWII. Thanks to the good off road characteristics, the vehicle was also able to operate on emergency landing fields which characterized the air bases in Africa and Russia. The vehicle was a widely modified version of the basic truck. As well as the addition of a fuel tank and it's pumping system, it was also equipped with a fabric cabin roof and a repositioned exhaust system to allow a safe refueling of airplanes. 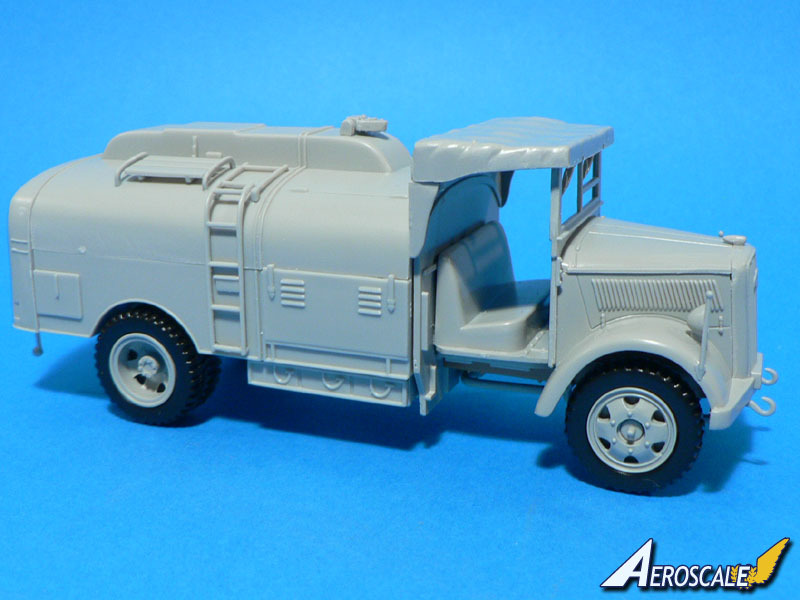 One would imagine that since the original Tankwagen was based on the truck version, the kit itself would be mostly based on the previously released Opel Blitz by Italeri (see review of the Tamiya rebox HERE), but this is not really the case. Apart from some parts which are identical, most of the content is brand new. At least it's the case of the bigger sprues B and C. What is common between both kits is the plastic chassis (in the original Italeri release it was made in metal (Interesting; it wasn't metal in the Tamiya reboxed Opel Blitz I reviewed - Rowan)), the wheel axles, the leaf springs, the wheel hubs, the radiator grill and some detail parts. Everything else is different and gives to the vehicle a very different look than the Kfz. 305. The quality of the plastic parts is good. I only found sink marks on the radiator grill part (Opel logo and registration plate) and on one shovel. Flash is very limited but some cleaning of the parts will be necessary, especially on the smaller ones located on sprue B. Though the driver's cabin is rather basic (and there is unfortunately no driver figure included), I would say that the overall level of detail of the kit is more than acceptable for the scale. Italeri have given the possibility to the modeler to leave the rear compartment of the fuel tank open. While the detail there is a little two dimensional I think that with some good painting it will look nice nevertheless. So it is definitely possible to depict the Tankwagen while in use on a diorama. This is not something which is possible to do on most plastic and even resin kits. The tires are provided on separate plastic sprues. I'm almost sure that at one point they were meant to be made out of rubber like in the Opel Blitz kit but that Italeri have changed their mind. I'm sure most people will be pleased by this decision and also that the chassis is in plastic and not in metal anymore. A small acetate sheet is provided as well for the transparencies. Unlike in some resin kits, the plastic is rather thick and, most of all, the parts are pre-cut, which will make them easier to use. The instructions are printed in black & white on a large panoramic sheet of paper. There are 10 pages in total with an History of the Tankwagen, a part's layout diagram, an 11 step assembly guide and a painting and decal guide. The latter can be found in color at the back of the kit's box. Unlike in most instructions, Italeri have used photos rather than drawings for their assembly guide. I would have preferred the more traditional method but the kit being not that complicated I think it won't make a big difference anyway. A - Kfz. 385, unknown unit, Italy 1944. B - Kfz. 385, unknown unit, Germany 1943. C - Kfz. 385, unknown unit, Germany 1945. Italeri's 1:48 scale Kfz. 385 is a very nice kit and should be very popular amongst the WWII Luftwaffe diorama crowd. I hope it will sell well and that the Italian manufacturer will continue to produce such interesting vehicles. Why not Regia Aoronautica related ones? Highs: Good level of detail - Low price. Verdict: Excellent kit which offers great WWII Luftwaffe diorama possibilities.